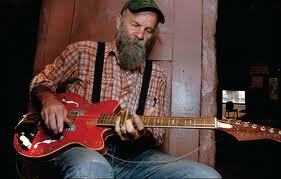 Seasick Steve is back in the doghouse, this time being held captive in the All Saints basement. AllSaints Spitalfields continue to bring you new music and exclusive content in the form of their widely acclaimed Basement Sessions project. Recorded and filmed in a warehouse space below their E1 London design studios, the weekly sessions present live performances, insightful interviews and upfront pod-casts for a global audience featuring new artists, pioneers and bastions within the music industry. The artists span indie-rock heavyweights to soul-blues newcomers and so far, AllSaints have locked PJ Harvey, Paloma Faith, Gary Numan, Maverick Sabre, The 2 Bears, Hervé, Aloe Blacc, Fatboy Slim, Kelis, Scroobius Pip, Liam Bailey and The Futureheads in the basement for their exclusive All Saints sessions.